I am sure I am in the minority, but I never put eyes on Alex Segura’s first Pete Fernandez novel, Silent City, and I am regretting that poor decision. 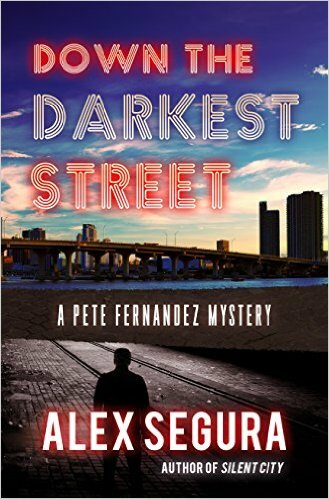 After reading Down the Darkest Street, Segura’s follow-up novel, I understand all the attention that was given to his first novel. The only criticism I can give this fine novel is it gives away all the plot points to the first novel and render reading it futile. As this book opens up, Fernandez is fresh off the adventures of the fist novel. He has joined Alcoholics Anonymous and is finding every day a struggle. He is working at a used bookstore and just wandering aimlessly through the days. His ex-fiancé has moved in with him (in an attempt at a platonic relationship) and when the husband she is separated from turns up looking for her and telling tales of a woman who has vanished, Fernandez is set on a collision course with another life changing mission. Fernandez teams up with his old friend, Kathy Bentley. Kathy still works at the newspaper and has connections that enable her and Pete to search for answers to the questions they believe will help them find the missing woman. As the hunt intensifies, Fernandez finds himself intertwined with a serial killer. Segura has a knack for being able to climb inside the head of his main character and not just write about his thoughts, actions, and internal struggles, but to make these struggles feel real and impactful to the reader. A great example of the show me, don’t just tell me style of writing, Segura demands that you care about Fernandez and the reader becomes immersed into the conflicts that rage inside Fernandez. I really wish this book didn’t contain so many spoilers for the first novel, as this proves Segura can pen a damn fine novel. If there is anyone out there who was foolish enough to pass up the first Fernandez book, grab a copy before you delve into this one. Anyone who enjoys solid PI novels will find a lot to love here and will be happy they grabbed this book.